by The Topps Company Inc.
Mars Attacks is familiar to most folks today as the 1996 Tim Burton movie, but long before it was a movie, Mars Attacks was a legendary gore-fest of a trading card set. Released in 1962, this beautifully lurid B-Movie on cardboard thrilled kids and disgusted adults with its retelling of “The War of the Worlds” only with Earth getting hammered a bit more by bug-eyed little green Martians. Banned on schoolyards, it became the stuff of legend, and is one of the most sought-after non-sport trading card lines of all time. Released to commemorate the fiftieth anniversary of the card set, Mars Attacks (the book) is a great little artifact that compiles all the cards from the set, front and back, in book form, printed slightly larger than the original trading cards. The foreword is written by Len Brown, who wrote the storyline for the card set (and later co-created The T.H.U.N.D.E.R. Agents with contributing Mars Attacks artist, Wally Wood), while the afterword is by Zina Saunders, the daughter of Norm Saunders, who provided the finished painted art for the card set. This is a terrific package. The hardcover book is a compact 6 by 7.5 inches and sports a cool dust jacket that mimics the wax packaging of the orginal cards in design and paper stock. Underneath the dust cover, readers will find an image of a stick of bubble gum (back in the day, instead of calling them “trading cards” or “non-sport cards,” these were known as “bubble gum cards” since every pack contain a stick of bubble gum). There are even four bonus cards held in a plastic sleeve on the inside back cover. The book is a real nostalgic treat, loaded with behind-the-scenes information and bonus artwork. Brown’s introduction reveals the genesis of Mars Attacks, and tells how he collaborated with Wally Wood, Bob Powell and Norm Saunders. Brown also details how a panicky call from a Connecticut District Attorney caused Topps to halt distribution of the set, leading to their extreme rarity. A complete set of original Mars Attacks cards in mint condition can easily commaned twenty-five hundred dollars. We’re also treated to a variety of bonus cards that were created for model kits and Non-Sport Update Magazine (disclaimer time here: I have been writing for NSU for more than fifteen years, and wrote the cover story for last summer’s issue devoted to Mars Attacks). The book is filled out with loads of behind-the-scenes preliminary sketches as well as photos of the packaging and retail boxes. 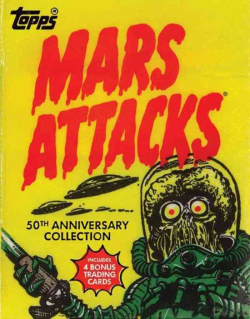 About the only thing missing from this set are the new cards that were created for yet another reissue set of Mars Attacks that was released last year, around the same time as this book. Maybe in a few years we’ll get to see a revised edition, although this is already a generous package, weighing in at over 200 pages. This “50th Anniversary Collection” of Mars Attacks is the latest in a line of cool, cleverly-packaged Topps Archive books from Abrams that include volumes on Wacky Packages and Garbage Pail Kids. Fans of Mars Attacks, cheesy sci-fi, vintage trading cards or anything retro-cool will love this book. It’s the perfect Valentine’s Day gift…for some people. This week we’re plugging a cool Kickstarter project that really doesn’t need our help, but it’s cool anyway. I met Art Baltazar a couple of years ago at MEGO Meet, where he was showing off some of his impressive custom MEGO figures, but I was already a fan of his work. Art and his partner-in-crime, Franco, produce some of the funniest all-ages comic books on the market. From Tiny Titans to Superman Family Adventures and beyond, Art has been able to break down barriers and make comics that appeal to hard-core comic book nerds and comics newbies alike. Last summer I thought Melanie Larch was going to hurt herself laughing when she had her first encounter with Bizarro Superman in the second issue of Art’s Superman Family Adventures. 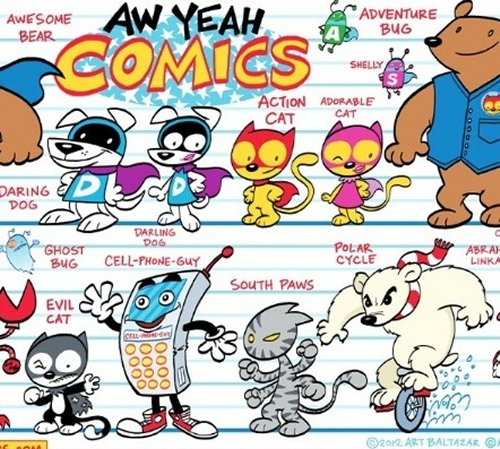 With Superman Family Adventures ending its run with issue #12, Art is moving into the world of self publishing with Aw Yeah Comics! (also the name of his comic book store in Skokie, Illinois). Art just kicked off this fundraising campaign a day or two ago, and met his $15,000 goal in less than eight hours. That will pay for the first six issues, and now he’s going for double that so he can guarantee a twelve-issue run. Considering that he’s less that four thousand bucks away from that goal, with 27 days left in the campaign, it’s a safe bet that we’ll get to see a full dozen issue at least. From the Kickstarter page: “AW YEAH COMICS! 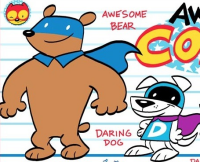 will be a new all-reader friendly comic book featuring characters created by Eisner and Harvey award winning cartoonists Art Baltazar and Franco. Though centered around Action Cat and Adventure Bug, AW YEAH COMICS! will have a whole cast of characters created just for this title.